Oh, the pain and suffering. a Wrigley Field would get new neighbors under developer's proposal for hotel, apartments ... ugh. a Lets stop pretending Wrigleyville is perfect ... I think this guy is a Sox fan. a How Will We Survive Another Year ... this one's a little old, but still relevant. a President Heckler ... more great commentary on Bill. a Billary's Adventures in Primaryland ... and more. a The politics of personality: Do you like these people? a Ritter's family says he didn't have to die ... very interesting. a Southern-bred actress has field day with role of devious co-worker ... Angela Kinsey rocks. Never mind. 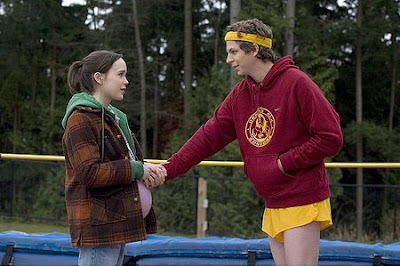 Kates and I saw “Juno” today. I literally had chills running through my spine as the end credits rolled, I thought it was so beautifully done. Smart screenplay, check. Great cast and acting, check. Sweet cinematography, check. Soundtrack I’d love to get my hands on, check. I could go on, but for the sake of trying to keep this post short, I’ll stop. Honest to blog. And now we’re watching “Little Miss Sunshine” for the second time. 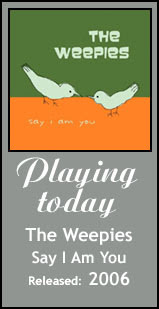 Not as good as “Juno,” but still an endearing movie everyone should see at least once. In fact, I'm thinking it's better the second time … Steve Carell so should have won an Oscar for his role. a 'Juno' Soundtrack More Goo-Goo Than Gaga ... I don't completely agree with J. Freedom du Lac's assertions, but he gives a good description of what the "Juno" music offers. a Who's the True Little Miss Sunshine? We had to have the garage door repaired. The Sears repairman told us that one of our problems was that we did not have a "large" enough motor on the opener. I thought for a minute, and said that we had the largest one Sears made at that time, a 1/2 horsepower. He shook his head and said, "Lady, you need a 1/4 horsepower." I responded that 1/2 was larger than 1/4. He said, "NO, it's not." Four is larger than two.." We haven't used Sears repair since. My daughter and I went through the McDonald's take-out window and I gave the clerk a $5 bill. Our total was $4.25, so I also handed her a quarter. She said, "you gave me too much money." I said, "Yes I know, but this way you can just give me a dollar bill back." She sighed and went to get the manager who asked me to repeat my request. I did so, and he handed me back the quarter, and said “We’re sorry but they could not do that kind of thing." The clerk then proceeded to give me back $1 and 75 cents in change. I live in a semi rural area. We recently had a new neighbor call the local township administrative office to request the removal of the DEER CROSSING sign on our road. The reason: "Too many deer are being hit by cars out here! I don't think this is a good place for them to be crossing anymore." My daughter went to a local Taco Bell and ordered a taco. She asked the person behind the counter for "minimal lettuce." He said he was sorry, but they only had iceburg lettuce. people doing driving?!" She was a probation officer in Wichita, Kan. When my husband and I arrived at an automobile dealership to pick up our car, we were told the keys had been locked in it. We went to the service department and found a mechanic working feverishly to unlock the drivers side door. As I watched from the passenger side, I instinctively tried the door handle and discovered that it was unlocked. "Hey," I announced to the technician, "its open!" His reply, "I know. I already got that side." Why!? are we talking about Tom Brady's foot. So he was spotted walking in a cast. Big deal. He's Tom Brady. He's with the Patriots. And the Super Bowl is still 11 days away. David Letterman had the line of the season the other night after his guest Dan Patrick predicted the Giants would win the Super Bowl ... Letterman told Patrick, The Giants could be up 60 to nothing at halftime, and the Patriots would still win the game 67-60. They're that good! But you know what? I'm with Patrick. I would not be surprised if the Giants did win. My cohort Brian was the first one to get the news alert about 3:30 ... to which all of us responded with reactions of What!? ... No way! ... You're kidding! Heathcliff Andrew Ledger (April 4, 1979 – January 22, 2008) was an Academy Award-nominated Australian actor. ... Ledger died in New York City on January 22, 2008. When the proposal came to post the breaking news on our Web site, someone asked if we even had enough to report. I said, "Who cares. Just link to Wikipedia. 'Stay tuned to Wikipedia where our breaking news reporters are on the scene for this developing story!' "
My good friend Matty sent me this blog about ugly baseball cards. For kids like me and you who grew up collecting these cards in the '80s ... All I can say is this blog totally rocks! How do you entertain a top entertainer? Have I mentioned how much I like Frank Caliendo? Not a whole lot you can do. 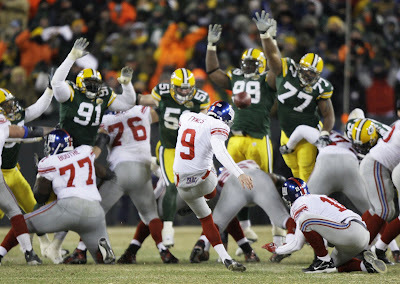 The Packers watched two missed field goals by the Giants, and still couldn't capitalize ... Given all that had happened -- and hadn't happened -- you knew Lawrence Tynes was destined to hit that winning field goal -- whether it was 47 yards or 77 yards. Another classic championship game ending. On the bright side ... It was a fantastically-fun season, which few people could have seen coming at this time last year. Brett Favre recaptured some of his old magic, and we discovered some new fan favorites too in Ryan Grant and that dazzling receiving core ... And Last week's "Snow Globe" game was the perfect ride before the crash. Just like the Brewers so-close-but-not-close-enough season. Nope, not a whole lot you can do. Except get into rooting for the Jayhawks. And remembering that pitchers and catchers report in a few weeks. a Packers fans show their love ... and craziness ... another good one from my friend Raechel. Terry Bradshaw was in New England to announce a football game one weekend when he noticed a special telephone near the Patriots' bench. He asked quarterback Tom Brady what it was used for and was told it was a hotline to God. Terry asked if he could use it. Brady replied, "Sure, but it will cost you $200." Terry scratched his head, then thought, "What the heck, I need help picking games." He pulled out his wallet and paid $200. Terry's picks were perfect that week. The next week, Terry was in Indianapolis when he noticed that same kind of phone on the Colts bench.He asked what the telephone was for and Manning told him, "It's a hotline to God if you want to use it, it will cost you $500." Recalling the previous week, Terry pulled out his wallet without hesitation and made the call. Terry's picks were perfect again that week. Last weekend, Terry was in Green Bay, when he noticed the same kind of telephone by the Packers' bench. He asked Brett Favre, "Is that the hotline to God?" Favre said, "Yes, and if you want to use it, it will cost you 50 cents." Terry looked incredulously at Favre and said, "Wait a second, I just paid $200 in New England and $500 in Indianapolis to use the same phone to God! Why do the Packers only charge 50 cents?" 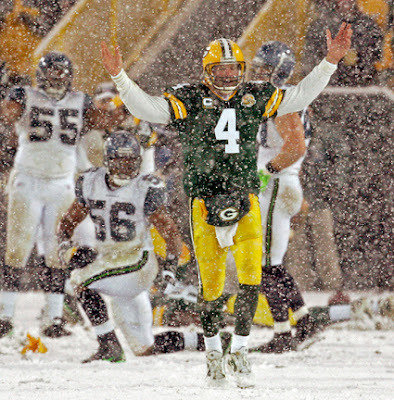 Favre replied, "Because in Green Bay, it's a local call...Welcome to God's Country." a Kids' area to be part of Miller Park renovations ... This is great, but shouldn't parents be watching their children and not the game? a Is Decade Doomed To Anonymity? On Jokim Noah’s rookie problems with the Bulls: He's the problem with the Bulls. He's all we've been hearing about since they got him ..."
And on Golf Week's noose cover: "Tiger said he didn't have a problem with the broadcaster. They're only making it worse..."
Ah, I've succeeded. I've taught her well. Kates and I watched the final pre-strike "30 Rock" this morning. I've said this before and I'll say it again: Never thought I'd say it a couple years ago, but "30 Rock" is my new favorite sitcom. My jaw dropped and my heart sunk for a moment as I read the news. Dang. One of the greatest thrills in my life remains actually seeing the production on Broadway ... And seeing the musical finally making it to film was icing on the cake. Those warm memories and images will always make me smile. The start of the Idol season is a lot like recommitting oneself to fitness excellence after seven months of sloth. My favorite audition bombs of the night: Alexis Cohen was a disaster, but snooty Christina "Princess Leia" Tolisano -- and her rant about Idol only taking models for its contestants -- was plain nuclear. ... So I had an interesting dream last night. Arguing ensued, and suddenly I shot to my feet, pounded my fists on a table in front of me and shouted something like "Enough!" A man sitting across the table, who I think was an attorney I know, looked at me and asked sternly, "So what should we do?" I couldn't answer him, no matter how badly I wanted to speak my opinion. I was speechless. And then Frank Caliendo was on too. A can't miss. Love him. Jane Hambleton has dubbed herself the "meanest mom on the planet." After finding alcohol in her son's car, she decided to sell the car and share her 19-year-old's misdeed with everyone — by placing an ad in the local newspaper. The ad reads: "OLDS 1999 Intrigue. Totally uncool parents who obviously don't love teenage son, selling his car. Only driven for three weeks before snoopy mom who needs to get a life found booze under front seat. $3,700/offer. Call meanest mom on the planet." The 48-year-old from Fort Dodge says she has fielded more than 70 telephone calls from emergency room technicians, nurses, school counselors and even a Georgia man who wanted to congratulate her. 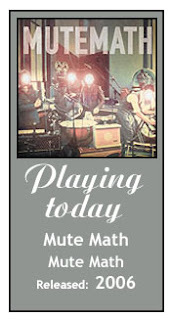 "The ad cost a fortune, but you know what? I'm telling people what happened here," Hambleton says. "I'm not just gonna put the car for resale when there's nothing wrong with it, except the driver made a dumb decision. "It's overwhelming the number of calls I've gotten from people saying 'Thank you, it's nice to see a responsible parent.' So far there are no calls from anyone saying, 'You're really strict. You're real overboard, lady.'" I’m making it my mantra for 2008. It's been bitterly cold here the last couple days ... Bring back the 60-degree tornado weather. We also thought it would be a great idea to paint the ceiling yellow -- also taken from bits of our décor. But when the yellow went on the ceiling Sunday night, Kates hated it … And for the record, I wasn’t exactly keen on it at first, either. But the more I studied it, the more I liked it -- it gave the room sort of a cool, whimsical feel, I thought. So guess what I was doing last night? That’s right -- painting the ceiling back to its former wedding cake white. I’m still enjoying the respite from trying to keep up with a constant flow of TV shows. Sorry, Writer’s Guild. Thursday we watched the final “Grey's Anatomy” -- which, for all my whining about how bad it’s become, actually shaped up decently in its last few episodes. And Sunday night we caught the final “Brothers & Sisters.” Love it. Wonderful, human drama. Kates and I do like the new “Cashmere Mafia,” … though reviews have been less than favorable. Time for some Internet fun. And then did anyone think the Patriots were going to lose? Right. I was rooting for the Colts, though I'm not entirely surprised the Chargers took care of them ... and then! How' bout them Giants!? I'm sure the whole neighborhood heard us hoopin' and hollerin' when R.W. McQuarters intercepted Tony Romo's final pass. Kates and I looked at each other, slapped a high five and chimed "See ya in Green Bay!" a Which teams got their holiday wishes? a Dawson getting robbed worse than Santo ... It doesn't matter. They both deserve to get in. a Price high for Orioles' Roberts: But Cubs seem ready to add Marshall to get quality leadoff man ... Sounds like a good deal to me ... as long as it doesn't include Matt Murton. a Alderman wary of Wrigley deal ... I kind of side with the alderman on this one. No one wants to see Wrigley turn into some schmaltzy, over-commercialized ballpark -- at least no more than it is already. a Dope Springs Eternal ... Good stuff from my friend Matt. a CLASS PRESIDENT 2008 ... a good perspective. a Obama Tries to Prove Electability to Blacks in S.C.
a Presidential Pet Display Finds a Place to Park ... now this is an exhibit I could really dig. 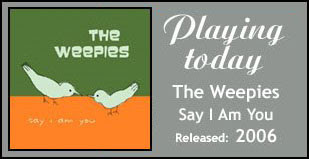 a Playing That '70s Funk Again, but Not in a Good Way ... Interesting how history repeats itself. a Ad-Libbing Late-Night Shows' Return ...Letterman and "A Daily Show" haven't been too bad so far ... Letterman shaving his beard during the show and having Goose Gossage deliver a Top 10 list? Not bad at all. a Late-night hosts back on schedule: Audience may prove tough to draw back ... I could see it. a A TV Lover's Lament ... Um. I don't miss it so much. a Last Air Jordans? Nike unveils 23rd Air Jordan ... and I've never ever owned a pair. a Picturing the World, Around Us ... Saw this exhibit several weeks ago. It's good stuff. a Make it a new year, not just another year ... a New Year's resolution all of us should live by. During points of listening to the 911 recordings yesterday, I was rolling my eyes at some callers and laughing at others. There was a ridiculous number of people who called 911 to ask why the tornado sirens were going ... Like a sheriff's source told me, No 1, 911 should not be used as an information line; it's an emergency line. And No. 2, if you see menacing skies and it's 60 degrees outside, you don't ask questions; the sirens are going -- that means you need to take cover. Here's a look at this morning's front page, Day Two of coverage ... and today's top story. There's also some great photos here and here. As of tonight, we're being told the tornado that touched down in the western part of the county was an EF3 that stretched 200 yards wide and crossed about 10 miles; the one that hit just north of us was an EF1. More than 50 homes were damaged; about 160 people were rendered homeless. And the most amazing statistic is that just 15 people were injured and nobody was killed ... There's some amazing stories being told too -- like a teenage girl who apparently was sleeping in an upstairs bedroom when she awoke and saw the house next door go down and got to her basement just before her own house collapsed. And a pair of sheriff's deputies I talked with tonight were aiding the victim of a traffic crash when the tornado hit, sucked the air out of them like a vacuum and left them literally hanging on for their lives to police cars and fire trucks. 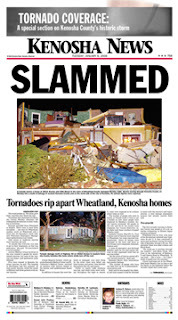 a Kenosha News coverage ... including photos. 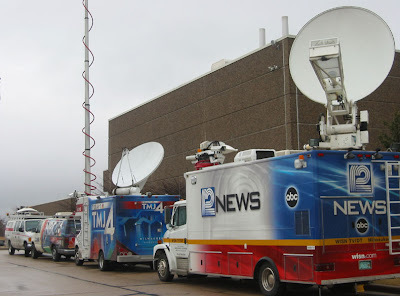 a Journal Sentinel coverage ... including today's NewsWatch blog. Up until about 3:45 p.m. today, the word of the day had been anti-climactic. Then, just after the judge had dismissed the jury and was about to settle a dispute between attorneys over a line of questioning, a sheriff’s deputy bursts into the courtroom and instructs us to evacuate to the basement of the courthouse. “There’s a tornado warning!” he says. We all looked up with dropped jaws … Right. Nu-uh. You’re kidding. It’s January! But the court clerk pulled up the weather report on her computer. Yep, there was a tornado warning. The deputy continued to get information: a funnel cloud had been spotted and it was heading our way. In the basement we waited for nearly a half hour. 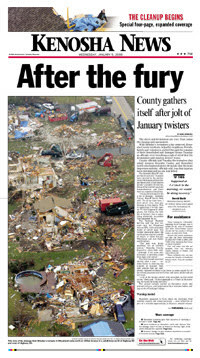 But we laughed a lot too, mused about the state of the jurors, and joked about the notion of having to start the trial -- which has already suffered six years of delays -- over again, or even that something as crazy as a tornado in January could be cause for a mis-trial. By 4:30, we were back to our third floor digs and our media room. Court was back in session (though not for long) and now we couldn’t make contact with anyone back in our office to relay our story. It turned out they had ducked into the basement too, and they were getting hit harder than we had . Yep. It’s rare enough that we get a tornado in this region. But it happened in January. The high temperature today was 63; until today the highest temperature recorded here in January had been like 47. A little after 6, Kates called and said she was home safe and sound. Meanwhile, I was just about to start my drive home, although not entirely sure how … We were stationed in the next county over, and we had heard the major highway connecting the two counties was flooded and consumed with damage. I ended up driving several miles north, getting turned around in a small town, and eventually ended up at a rural gas station, just behind a semi-truck. I filled my gas tank, and went inside the store looking for some food. And the trucker had a map sprawled on the counter as he asked the clerk for directions to another major highway. They looked at me for advice as I walked in. I threw up my hands. “You’re in the same boat I am,” I said, before joining them at the counter and deciding that the best route was for us to head back south, into Illinois and around the bottom edge of the county until we could hook up with the Interstate. It took me nearly two hours to get home tonight. But it worked. Now Kates and I are marveling at the news coverage on the TV, seeing all the damage, and feeling thankful that we’re ok.
Quite a day. I'm tired. I promised more about the Mitchell Report. I’m sorry it took tonight’s highly-touted Roger Clemens interview on “60 Minutes” to inspire me (Boy, would I like to see the ratings numbers on that one … I’m not sure I’ve ever received so many emails and text messages on a single subject in such a short time. They were coming in the minute it was over … ). I have a bleacher row of friends who disagree with me on this, but I'm a Clemens fan. I can't recall seeing him bull-headed or surly with the media the way Barry Bonds has been. Clemens has had a long, sustained career, without the types of injuries a lot of guys supposedly using steroids have had. He’s also been a great ambassador of the game and a class act -- excluding, perhaps, the whole Piazza-Bat-Gate thing. And yes, I’d still vote for him to go into the Hall of Fame. Clemens, like Bonds, has somehow defied the odds and performed far better than guys have his age when his performance should have been declining. The stuff about him in the Mitchell Report is pretty damning, and his reputation is damaged no matter what happens. And I'm sick of talking about the game's long nightmare, too ... which is part of the reason it took me so long to post about it.